A gravity defying act: Limbo dancing Kenyan style! 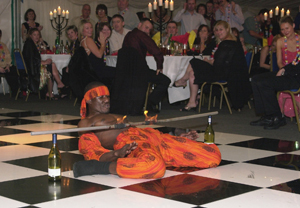 Kaniki performs a high quality limbo and fire act which includes great participation and communication with his audience. He can appear with a female assistant if required. He also works with other male Kenyan African artists. 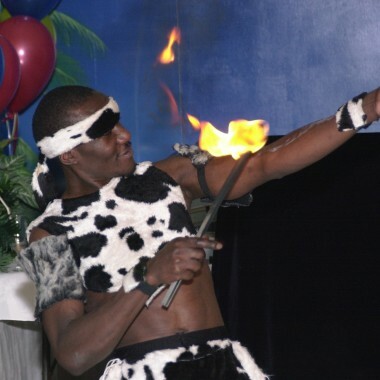 ‘The Afrobats’ offer their own traditional style of acrobatic and tumbling moves together with fire eating and Limbo. The artists have travelled throughout Europe and further afield demonstrating their amazing physicality. Appearances including carnivals, corporate events, festivals and weddings parties. They can perform mix ‘n’ mingle and a short cabaret spot featuring solo, duo and trio work. The group are able to teach the skills at team building events or as part of an educational outreach programme for schools and colleges. Kaniki and the other Kenyan artists also offer Maasai warrior costumes for meet ‘n’ greet and more.